After a long day at work, it’s no surprise you’re here, desperately searching for a way to get paid to watch Netflix. What would be better than grabbing a drink, reclining in your favorite chair, pressing play on Netflix, and watching the dollars flood into your bank account? Unfortunately, it’s not quite that simple. All of those YouTube videos and sketchy websites claiming that Netflix will pay you to watch videos? They lied. While there are lots of amazing work-from-home jobs, getting paid to watch Netflix isn’t one of them — at least not the way you’re thinking. However, there are lots of flexible online jobs and side hustles you can use to make money and watch Netflix while you work, rather than actually getting paid to watch Netflix. See the difference? Remember, no one is just going to give you cash for no reason. 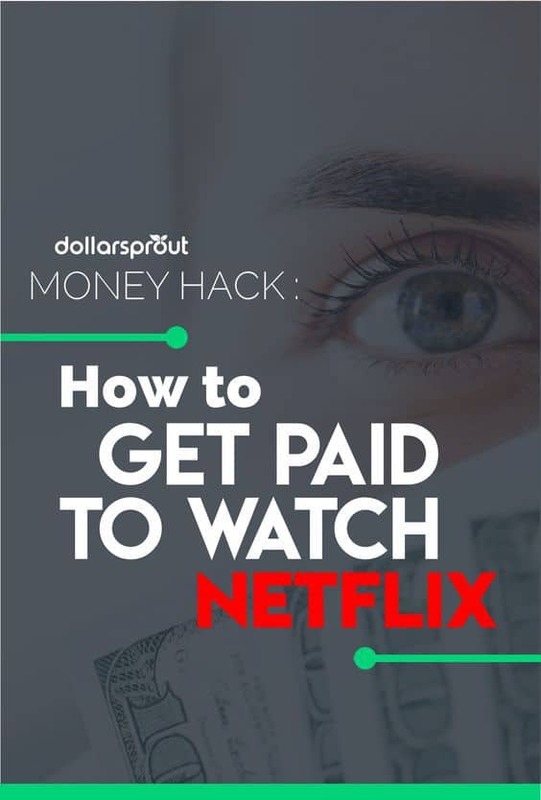 Earning money while watching Netflix does involve a little bit of work on your part. But why not get paid to watch Netflix, TV, or your other favorite movies at home if you’re going to do it anyway? According to Time, the average Netflix user watches over an hour and a half per day. That’s 568 hours per year. For perspective, a full-time work schedule consists of about 2,080 hours per year. As you can see, 568 hours is a lot of relaxation time, and it’s not necessarily great for your wallet. By watching Netflix, you’re effectively wasting over 14 work weeks of time, bringing in a whopping zero dollars. Wouldn’t it be great if you could use that time to bring in a little extra spending money and get paid to watch Netflix? So what’s the catch? Honestly, there is none. It’s not a lot of money. If you need money today in order to cover rent, this isn’t going to get it done by itself. I don’t know how to help you get rich by watching Netflix. But what I do know is how to help you earn a little more pocket change during your downtime. The way I see it, I was making zero dollars before when I was watching Netflix. As long as I’m making more than zero dollars, and it’s not interfering with my shows, it’s worth it. The easiest way to start getting paid to watch Netflix (or get paid to watch movies at home in general) is through Swagbucks. Swagbucks is a rewards site that pays you for completing various activities, from buying products online to completing online surveys. And yes, you can even get paid to watch Netflix. For each activity you complete, you earn points, called “Swagbucks.” Every 100 Swagbucks is worth $1. You can redeem your Swagbucks for PayPal cash or free gift cards of your choosing. My favorite is the prepaid MasterCard. It’s just like cash, and if you save up enough Swagbucks they usually go on sale. That means you can potentially get $25 on a prepaid card for $24.50 worth of Swagbucks. If you’re not quite that patient, you can redeem your Swagbucks for gift cards as low as $1, and the Amazon gift cards start at $3. You can get a free account by signing up with just your email address. They even give you a free $10.00 just for trying it out. There are plenty of other ways to make a little extra cash on Swagbucks — we’ve written about them before — but for right now we’re just going to focus on the videos. They don’t ask for anything but an email (or Facebook if you prefer). You don’t need to provide any sort of credit card information to get started. Once you sign up, you’re ready to move on to the next thing you’ll need. If you don’t have one, check out the instructions below to set it up on your laptop or desktop. It takes a couple more steps, which is why I didn’t include the instructions here. Once you’ve signed up for Swagbucks, you’re ready to download the app and get started. Turn the volume down on your phone, and remember to turn on WiFi so you don’t use all of your data. Swagbucks will pay you to watch videos on your phone or tablet; usually just a few cents per video. Now all you need to do is open the app, click “Watch”, and choose a video. Once you choose your video, you can set your phone down and start watching Netflix on a separate device. It’s not the most glamorous side hustle in the world, but if you’re one to go on serious Netflix binges, having Swagbucks play videos in the background is one of the easiest gigs out there. You will need to pay some attention to the Swagbucks app as you are doing this because there will be intermittent ads that run during your videos. These will actually stop your videos. If you close out of them, the videos will keep playing (and you will keep earning). I earned 12 more “Swagbucks” while writing this article. Sign up for Swagbucks if you haven’t already, and get paid to watch movies that you were going to watch anyway. Opening the Netflix app or internet browser and log in to Netflix. Open another browser tab and sign in to Swagbucks. Once you sign in to Swagbucks, click on a video to start the auto-play. When a new video starts on Swagbucks, the sound goes all the way up even if you muted it. Now you can officially watch Netflix in peace and get paid to watch movies at home. Remember to check back every once in a while to make sure your videos are still playing. You can’t get paid to watch Netflix if the videos are paused or they’re stuck in a buffering sequence. There are Netflix jobs available to people who work from home. But like every other position, Netflix jobs take concentration and plain old work. Take Netflix taggers, more officially known as Netflix Analysts, for example. Netflix taggers get paid to watch Netflix and “tag” movies and shows with relevant metadata. This metadata includes information about the cast, director, release year, and other objective stats. It also categorizes films on a more subjective level. So when a group of movies pops up on your account “Because you watched Definitely, Maybe,” that’s the work of Netflix taggers. The position requires a lot of time spent watching Netflix, but not just anything you want. Plus, not everyone is cut out to be a Netflix tagger — you have to pass a writing exercise and prove your knowledge of TV and film. If you’re smart about it and you can multi-task, then using Swagbucks can help you cash in on your time spent watching Netflix. To be crystal clear, there’s no way to receive a check from Netflix unless you’re a Netflix contractor or employee. If working for Netflix is something you’re itching to do, you can keep an eye on their jobs openings here. Just keep in mind that you’ll likely be sitting in an office working and not watching movies if you choose to work for Netflix. Take my advice and keep your day job or look for other flexible online jobs. Use Swagbucks in your spare time for some extra cash, but don’t expect it to replace your paycheck anytime soon. After around an hour of videos, I checked swagbucks to see a message “You’ve hit today’s earnings limit.” Hadn’t even earned 20 swagbucks/$0.20 cents at that point. I don’t see how $225/month will be possible with this method. I think what Olaf is getting at is that you can do it anytime (any downtime), but it makes sense to do it while you’re just in the middle of a Netflix binge/mindlessly can mash a few buttons and let a few extra bucks come your way! I am from New Zealand can i sign up to watch Netflix? You sure can, both Swagbucks and Netflix offer their respective services in New Zealand! Good luck! Sadly I can’t use Swagbucks in my country. Can I use swagbuck from Nigeria and can I get paid via PayPal account, thanks. Unfortunately, I don’t believe Swagbucks is available in Nigeria. Sorry! In most web browsers, you can mute the sound without going thru the mixer settings.. Using Firefox you can toggle the sound on/off with CNTL-M.. while Chrome can do it by right clicking on the tab and select mute site (only active while video/sound is playing). Hello! There’s also another way you can earn money while watching TV. I signed up for a paid survey website called Grab Points and they have other offers on the website as well, one of which is called Hideout TV. All I do is have it playing on my laptop (sound off of course) and check on it every couple hours or so to make sure it’s still going. The videos play automatically and I’ve already been able to redeem my points on Hideout TV for Grab Points points. I’ve found it’s a great way to earn a few extra bucks a month. 🙂 Hope this helps someone! I use swagbucks apps on my phone. Please remember to only be signed in at one place at a time your phone or your computer… if you try and watch videos on both at the same time you will get banned.